Why Introverts Tend to be Quiet? 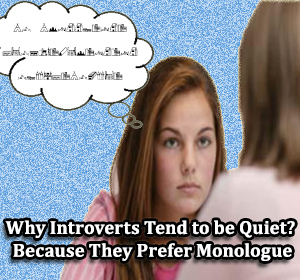 Because They Prefer Monologue - It's no secret that the introvert is identical to the figure of quiet. I myself feel more comfortable being a listener on various occasions to gather with others. Sometimes I do is just listen, but sometimes also analyze what people are saying. More than just hear, I often monologue quietly in my brain. So that I read that the frontal lobes are more widely used by iintroverts to plan, think about the settlement, and remember, it is true! I did not realize until monologues ever a time I guess I just think, accidentally, spoken and heard by my husband. Introverts are skilled with his own world. When someone extrovert able to think and immediately present the results of what they are thinking, the process stops at the 'brain' for the introvert. What thought do not necessarily spoken or conveyed. Therefore, it is reasonable why introvert is a better understanding of theirself than others, principled, and happy to be theirself. Because often a monologue and absorbed in his own world that's why introverts look insensitive to the surrounding circumstances. And do not be surprised if you see someone on a social media who is friendly and charming, but it impressed shut down to meet in real life and looks unpleasant. But it does not mean they're annoying . Conclusion of the opinion that I put forward is that an introvert is often seen as personal silent or shy or unreachable because they prefer a monologue and or talk to theirself in the 'brain'. However , an introvert remain reliable for many things . And being an introvert is not a mistake . Keep being yourself is the best! Be happy, you all Readers!